One Fat Frog Restaurant Equipment has a ton of used, high quality tabletop restaurant equipment for sale at drastically discounted prices. 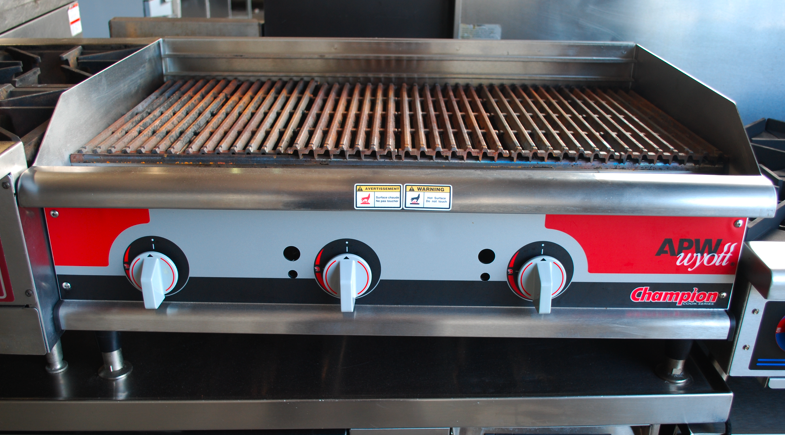 One of the most popular pieces of used tabletop restaurant equipment is used tabletop charbroilers and broilers. One Fat Frog Restaurant Equipment has several used tabletop charbroilers and broilers available from brands including Vulcan and Wolf. To ensure the safety of the food and sanitation of the food and charbroiler or broiler, it is important to follow some easy steps. One Fat Frog Restaurant Equipment would like to let you know some food safety and sanitation essentials for used charbroilers and used broilers, available now at One Fat Frog Restaurant Equipment. Charbroiler performance and optimal cooking results depend on proper cleaning. Products cooked on a charbroiler that exhibit well-defined sear marks (“branding”) are appealing to customers. During service, grates should be cleaned routinely with a coarse steel brush between product loads. Cooking grates should be routinely dressed with vegetable oil after they are wire-brushed to facilitate a clean, non-stick release when the food portion is turned. Poor cooking performance can also occur if the grates are clogged or closed due to grease buildup and improper maintenance. One Fat Frog Restaurant Equipment offers easy financing for anyone who needs it – no matter what shape your credit is in. One Fat Frog Restaurant Equipment also welcomes Quick cash deals and package deals towards the entire stock of used commercial restaurant equipment – including used tabletop charbroilers and used broilers. People travel from all over Florida and beyond to shop for used commercial restaurant equipment at One Fat Frog Restaurant Equipment. Clients have travelled from Arkansas, New York, Georgia, South Carolina, and more to save big at One Fat Frog Restaurant Equipment! Come by One Fat Frog Restaurant Equipment today!